VIDEO: Warriors’ Stephen Curry sets new record for 3-pointers and 40 Points highlights against Rockets - Balita Boss! The Golden State Warriors pushed the Houston Rockets to the brink of elimination in the Western Conference finals with a 115-80 victory on Saturday night (Sunday morning in the Philippines) to take a commanding 3-0 in the best-of-seven series. Stephen Curry finished with 40 points on 12-for-19 shooting from the field and 7-for-9 from 3-point range with five rebounds and seven assists. Teammates Klay Thompson and Draymond Green added 17 points each. The Season 2014-15 MVP also broke Reggie Miller's playoff record of made three-pointers. Miller's record has been standing since the 2000 NBA playoffs when he hit 58 three-pointers in 22 games. 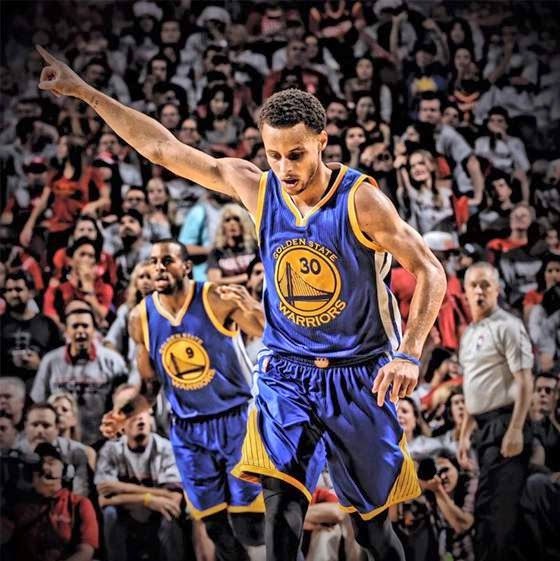 It only took Curry 13 games to set the new playoff record for most 3-pointers. Curry entered the game needing two three-pointers to break the record, which occurred with a second-quarter shot from the top of the key with 4:32 remaining. In other highlights, Curry outrebounded Dwight Howard in one play. Using some muscle, Curry sealed Howard with a perfect box out to grab an offensive rebound. Howard, a 6’11” center, is averaging 14 rebounds a game in the playoffs. Curry, a 6' 3" guard, is averaging five rebounds a game in the playoffs. James Harden, who scored 17 points on 3-of-16 shooting from the field, led the Rockets. Howard finished with 14 points and a game-high 14 rebounds. The Rockets will still host Game 4 on Monday night (Tuesday morning in the Philippines) looking to avert a sweep.